Treat your complexion to the GLAMGLOW Gentle Bubble™ Daily Conditioning Cleanser; a mild, soap-free formula that effectively eliminates impurities without over-drying. Infused with a cocktail of beneficial ingredients, including Oat Amino Acids, Apple Extract and TEAOXI® Green Tea Leaf, the luxurious cleanser gently removes dirt and makeup to reveal a clear, healthy-looking visage. 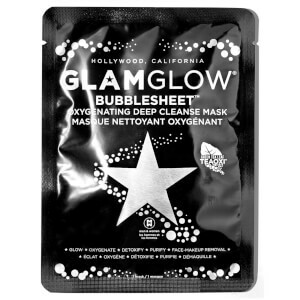 Inspired by the rainbow aura of bubbles, you can expect super soft, glowing skin that feels comfortable and conditioned. Free from parabens, sulphates, phthalates, silicones, oil, soap and petrolatum. Apply to wet face and gently massage evenly in circular motions. Rinse well and pat dry. Use daily as desired. Avoid eye area. Water\Aqua\Eau, Sodium Cocoyl Glycinate, Glycerin, Cocamidopropyl Hydroxysultaine, Sodium Lauroamphoacetate, Sodium C14-16 Olefin Sulfonate, Pyrus Malus (Apple) Fruit Extract, Acrylates Copolymer, Cocamidopropyl Betaine, Sodium Lauroyl Oat Amino Acids, Tocopheryl Acetate, Camellia Sinensis Leaf Extract, Ethylhexylglycerin, Maltooligosyl Glucoside, Hydrogenated Starch Hydrolysate, Sodium Chloride, Tin Oxide, Sodium Hydroxide, Hydroxypropyl Guar Hydroxypropyltrimonium Chloride, Caprylyl Glycol, Propanediol, Citric Acid, Lauric Acid, Coconut Acid, Polysorbate 20, Polyester-11, Peg-150 Pentaerythrityl Tetrastearate, Ppg-2 Hydroxyethyl Cocamide, Sodium Cocoamphoacetate, Disodium Edta, Tetrasodium Edta, Phenoxyethanol, Mica, Titanium Dioxide (Ci 77891).